if you go to the clubs page you can't click the join button as it's invite only!! i think that is really rude!! we interviewed clarapop to see what she thought of the club!! 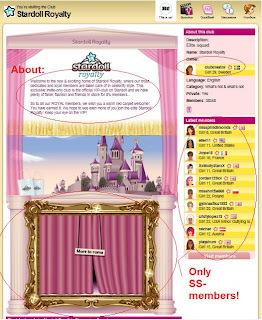 what do you think about stardoll making new staff just to run the royalty club? -I think it fine that Stardoll makes new stuff, Because then we will have something to do here! But stardoll should also make stuff for the non SS to enjoy also themselfs.. If they don't, What's even the point of being here? 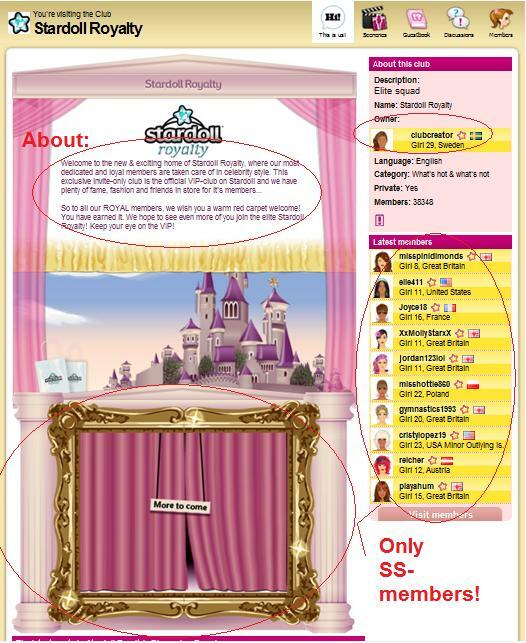 is there any gossip coming from the staff of stardoll royalty? could you tell us some of the members name who are well known? how many members are there in total? do you think stardoll is being unfair witht his club?? -Yes, I think its unfair, Because like I said, I think that ss and non ss should have both the fun on stardoll, We are all the same really, I think also that its temting for non ss medolls to become ss and then stardoll just makes money, That makes me sick. really, But in other words, I think its unfair! who are the managers in the club?? - There are no managers, But there is a owner, Her name is clubcreator, Go and check her out! I don't like how some members (like you), don't get picked because of the determination and work they do on stardoll is amazing! Although, members who do get picked should have a right to celebrate there achievements and hard work on stardoll!